Armed Forces Day in Kyrgyzstan is celebrated annually on May 29, marking the anniversary of the creation of the Kyrgyz Armed Forces in 1992. The territory of Kyrgyzstan had been part of the Turkestan Military District from 1874 to 1992 (with a brief interruption after the October Revolution of 1917). During the Soviet period, the main military force on the territory of Kyrgyzstan (then the Kirghiz Soviet Socialist Republic) was the 8th Guards “Panfilov” Motor Rifle Division formed during the Second World War. After the collapse of the Soviet Union, the forces of the Turkestan Military District were distributed between five newly independent Central Asian countries – Uzbekistan, Turkmenistan, Tajikistan, Kazakhstan, and Kyrgyzstan. Thus the Armed Forces of the Republic of Kyrgyzstan were formed. 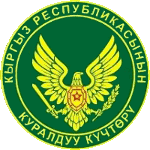 The military of Kyrgyzstan includes the Army, the Air Force, Air Defense Forces, the Frontier Force, and Special Forces (such as the National Guard). Kyrgyzstan dos not have the Navy as it is a landlocked country. The country's Armed Forces consist of about 15,000 active personnel. Kyrgyz Armed Forces Day is marked with celebratory events held in military units throughout the country.